We arrange Pilgrimage to Jerusalem on a regular basis. Feel free to contact us for more information. Meeting at the Metro Airport in Detroit at 12:15 PM; flight to Toronto AC7364 at 2:15 PM, arrival in Toronto Airport at 15:27 PM. Departure from Toronto to Tel Aviv at 4:50 PM with AC084. Meals on board. Arrival in Tel Aviv airport at 10:15 AM local time. Warm welcome from the guide at the airport. Panoramic view of Tel Aviv. Short stop at Jaffa and transfer to Jerusalem for panoramic view of the highlights, visit the Christian square of the Old City. Transfer to Bethlehem for dinner in the hotel. The Nativity Church, where our Lord Jesus was born in the cave. 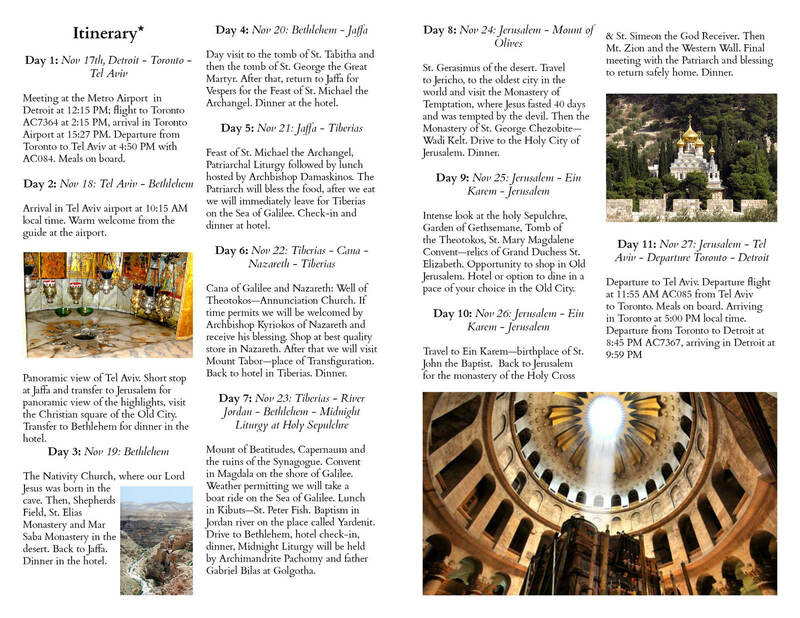 Then, Shepherds Field, St. Elias Monastery and Mar Saba Monastery in the desert. Back to Jaffa. Dinner in the hotel. Day visit to the tomb of St. Tabitha and then the tomb of St. George the Great Martyr. After that, return to Jaffa for Vespers for the Feast of St. Michael the Archangel. Dinner at the hotel. Feast of St. Michael the Archangel, Patriarchal Liturgy followed by lunch hosted by Archbishop Damaskinos. The Patriarch will bless the food, after we eat we will immediately leave for Tiberias on the Sea of Galilee. Check-in and dinner at hotel. Cana of Galilee and Nazareth: Well of Theotokos—Annunciation Church. If time permits we will be welcomed by Archbishop Kyriokos of Nazareth and receive his blessing. Shop at best quality store in Nazareth. After that we will visit Mount Tabor—place of Transfiguration. Back to hotel in Tiberias. Dinner. Mount of Beatitudes, Capernaum and the ruins of the Synagogue. Convent in Magdala on the shore of Galilee. Weather permitting we will take a boat ride on the Sea of Galilee. Lunch in Kibuts—St. Peter Fish. Baptism in Jordan river on the place called Yardenit. Drive to Bethlehem, hotel check-in, dinner, Midnight Liturgy will be held by Archimandrite Pachomy and father Gabriel Bilas at Golgotha. St. Gerasimus of the desert. Travel to Jericho, to the oldest city in the world and visit the Monastery of Temptation, where Jesus fasted 40 days and was tempted by the devil. Then the Monastery of St. George Chezobite—Wadi Kelt. Drive to the Holy City of Jerusalem. Dinner. Intense look at the holy Sepulchre, Garden of Gethsemane, Tomb of the Theotokos, St. Mary Magdalene Convent—relics of Grand Duchess St. Elizabeth. Opportunity to shop in Old Jerusalem. Hotel or option to dine in a pace of your choice in the Old City. Travel to Ein Karem—birthplace of St. John the Baptist. Back to Jerusalem for the monastery of the Holy Cross & St. Simeon the God Receiver. Then Mt. Zion and the Western Wall. Final meeting with the Patriarch and blessing to return safely home. Dinner.